Rapid heartbeat, is a condition in which this vital organ beats more than 100 times per minute. This is quite normal when we are emotionally excited, exposed to some stress or when we train. On the other hand, when we exclude these three states, tachycardia may be a sign that our body experiences processes that threaten the health of the cardiovascular system. Since it comes to an organ of vital importance, it is necessary to constantly pay attention to its work. Regular check-ups are the best way to preserve health, and in addition it is advisable and keep a healthy lifestyle and proper nutrition. Below we will explain what characterizes a rapid heartbeat in children and adults, what are the symptoms and how this condition is best treated. What is the normal number of heart beats per minute? It is only natural to wonder sometimes, "whether my heart is normal ', because you may think once in a while that it beats too slowly, and sometimes quickly. This is due to various circumstances, but certainly both conditions - slow and increase heart rate, and cannot be considered innocuous. The optimum heart rate according to current medical standards is 60-100 beats per minute. However, the heart rate may have different values ​​among people, therefore it regularly needs to be checked by an expert. Consequently, it is argued that the most ideal number of heart beats per minute is 50-70 beats per minute. It is generally characteristic for people who are actively involved in sports, whether recreational or professional. It occurs in those people who naturally have low blood pressure. Heart rhythm disorder occurs when the heart rate exceeds the upper normal value. Then there is a tachycardia, which may be transient, but also indicates the presence of some serious health problems. Therefore, it is very important to regularly control the heart rate in order to be sure of proper operation. When it comes to tachycardia causes can be multiple, which basically depends on each person individually. Generally speaking, the rapid heartbeat is accountable to all those conditions or factors that interfere with the normal electrical impulses that control the rate of pumping blood. In order to adequately treat fast heart rate, it is essential to establish exactly which factors affect its occurrence. In order to eliminate the causes of tachycardia it must be recognized in time, it is very important to report to your doctor as soon as possible, which would refer you to a specialist cardiologist. What we can advise is living a healthy life, with increased responsibility to yourself and your body. This way you will largely avoid the risk of many cardiovascular diseases. Increased heart rate at rest can be the result of things that we mentioned earlier. In these moments, the heart rate becomes too fast and the person can feel it in the chest. All this is happening because this vital organ struggling to pump enough blood to the rest of the body, but is not succeeding. Then our organs and tissues remain deprived of oxygen, so you may notice that you have completely blue fingers and nails. Some people even do not manifest any of these symptoms, it is not at all unusual. In such cases, the tachycardia is noticed only when it comes to a regular physical examination. It is not rare for a rapid heartbeat to occur during pregnancy. During those nine months, in your body there are undergoing numerous changes, increased secretion of hormones, so your heart has to work harder and harder. In general you should not be surprised when just at that time you have tachycardia. Then your body creates new life, so a mild heart rhythm disorder is expected. Given that this is a completely normal phenomenon, do not panic, but accept the resulting situation. When tachycardia occurs in pregnancy, there is fatigue, there is also pain in the chest and palpitations. Of great help for pregnant women can be chamomile tea, because it has a proven calming effect. However, it is advisable to regularly check with a doctor during this period. You must be certain that the rapid heartbeat during pregnancy is only transient in nature. What types of tachycardia can we distinguish today? Characterized by the fact that the rapid heartbeat occurs in the form of rate exceeding 100 beats / min. Gradually occurs and also disappears, and usually manifests itself as a result of a greater physical effort. Of the other causes that cause sinus tachycardia mentioned: fever, anaemia decreases the level of oxygen in the blood, stress, psychological stress, disrupted work of the thyroid gland. Medical sources to all of this also add excessive alcohol intake, caffeine and nicotine. You need to know how sinus tachycardia can be normal (acute) and pathological (chronic). The most common is after strenuous physical exercise and is the most commonly encountered in bodybuilders. However, it should not be lightly accept and ignored, because it can be a sign of and a trigger for many other diseases. In addition, it often occurs in patients who have congestive heart failure, a severe lung disease, or a problems with the thyroid gland. When it comes to treatment for heart tachycardia commonly prescribed are beta blockers. When this rapid heartbeat occur, it is the result of improper operation of cardiac chambers. 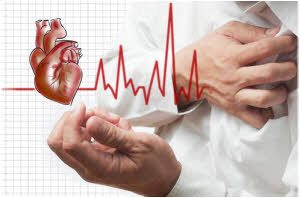 It is a condition that is dangerous to health and may eventually lead to fibrillation, and if it is not treated it can perform asystole, and sudden death. Therefore it is very important to recognize the symptoms and seek medical attention. Ventricular tachycardia is characterized in that it lasts longer than half a minute after which it creates a temporary cardiac arrest. When it comes to heart beats per minute, it is in the state between 120 and 200 beats per minute. The acute phase of the disease can be cured with the help of an antiarrhythmic. If the patient shows signs of improvement, then apply DC shock methods. In this case, rapid heartbeat occurs as a result of improper operation of the upper atria and arteries. It manifests itself as a fast and balanced rhythm, and what is unique in it is that it starts and ends abruptly, without any prior indication that this condition may occur. Heart rate is in the range between 150 and 220 beats per minute. If it occurs in healthy individuals, it is not dangerous and is transient in character. However, the symptoms of supraventricular tachycardia are very unpleasant. First of all, with a fast heart rate at rest, there is a feeling of weakness, dizziness and sudden sweating. It can also be caused by excessive consumption of alcohol and coffee, and there is also a rapid heartbeat after eating, out of a sense of excitement, which can be a trigger. In the case of acute conditions recommended is use of antiarrhythmic drugs, and if there is no positive response, then the doctor suggests a radiofrequency ablation. Diagnosis and early detection of this disease is very important when it comes to rapid heartbeat. This is done based on the clinical examination by a specialist, as well as of a history of the disease. The best indicator when it comes to the tachycardia is ECG of heart. The electrocardiogram is a recording of cardiac activity, and it is the most reliable basis for determining the symptoms and for the adequate diagnosis. What the doctors can insist on is exercise test, ie. it is the test of load which can be exercised on a treadmill for running or on the bike. Thus is determined whether the rapid rate at rest in the same degree as in a continuous movement and physical activity. With this test it can be best recognized that the type of tachycardia comes in question. In addition to this method, with the help of ultrasound examination (echocardiography) we can observe the heart rate, as well as how the body works. In this way we can observe any changes in the heart muscle and to realize all the irregularities. Then, when it comes to tachycardia treatment it very important to fight against this disease. Laboratory analysis can show if the anaemia is the cause, or if some other problem occurred it. We have already mentioned some of the drugs used to treat tachycardia. In the case of some other disease which cause rapid heartbeat, then other therapy for treating only this health disorder is prescribed. If you cannot determine the cause, and stop tachycardia, treatment is carried out with the help of beta-blockers, such as bisoprolol. In addition, the cardiologist may recommend therapy with anti-arrhythmic drugs or amiodarone and propafenone. In some cases, rapid heartbeat in the morning, accompanied by difficulty breathing, is related to calcium channel blockers. If it happens that these drugs do not contribute to the improvement of health conditions, ablation is used so as to deactivate the spot from which impulses are coming from, and ultimately resorting to surgery. If you notice a rapid heartbeat after eating or during sleep, hold your breath for a while and then drink a glass of cold water. It is advisable to wash your face with the same, because these are the ways by which you can help yourself if you manifest irregular heartbeat. If you are already struggling with this phenomenon, you should know that there are certain ways and methods for treating tachycardia naturally. As the saying goes: "Health enters through the mouth" shows the best ways to treat arrhythmia with proper nutrition. Mediterranean food proved to be very effective, because people who have grown up using this food are the least likely to develop a cardiovascular disease. As a natural remedy for tachycardia omega-3 fatty acids stand out, found in fish. In addition, it is necessary to pay attention to consumption of sufficient quantities of potassium and magnesium in your body. The herb hawthorn has been used for a very long time as a natural remedy for tachycardia in the form of tinctures. It is very easy to make it and it is desirable to consume this product for preventive purposes. During the spring, this plant is flourishing, but then you have to be sure to pick its leaves and flowers. In addition, make the tincture with 1 dl of medical alcohol (90 percent). Freshly harvested leaves and flowers cut into small pieces and put them in a jar. Pour them with alcohol and let it sit for three weeks at room temperature. After the expiry of this period, squeeze the tincture of hawthorn through cheesecloth into a glass bottle. Consume this natural remedy for rapid heartbeat in the morning every day, always before breakfast and before the other main meals (3x daily). Take 15 drops of this mixture diluted with a little water. Generally speaking, the best natural remedy for tachycardia is - a healthy life. This means completely avoiding the consumption of fast food, especially those processed industrialy, and total rejection of alcohol and cigarettes. Try to minimize use of table salt, because it can be very harmful to your heart. Today, due to sitting and passive lifestyle and improper diet often fast heart rate occurs often in children during puberty. Do not let them sit all day at the computer playing games, encourage them to play some sports and be physically active. Moderation is most important, what is meant, for example. Is that sinus tachycardia often occurs due to excessive physical activity. For rapid heartbeat and shortness of breath recommend is consumption of garlic. It contains acilin that affect the regulation of blood pressure, so it is considered the most effective natural remedy for tachycardia. It is far better to consume garlic that tablets. General recommendations for keeping a healthy life is regular physical activity, more movement, a lot of fresh air, especially along the river with trees. Bring your pet or go on an easy bike ride or whenever the opportunity occurs. If there is a tachycardia complications are something that you should definitely pay attention to. It most frequently manifests with increased blood clotting, which significantly increases the chances of a heart attack. In addition, if you cannot carry out regular tasks, heart failure is also possible. This means that you do not perform the proper distribution of blood plasma in the body which may cause serious impact on the work of the organs. In these cases speech defects, or numbness on one side of the lips and tongue may occur. This spasm should by no means be neglected, because it is the latest indication that something is wrong with the heart. In the end, the consequences can have a fatal outcome, sudden death due to the halt operation of this vital organ may occur. A risk factor is something that increases the likelihood of developing this disease, which entails other problems. For example, obesity significantly increases the chances of diabetes type 2. When it comes to tachycardia, the risk of its occurrence is increased if a person does not care about their health and nutrition. It is therefore very important to pay attention to what we eat and how we take care of ourselves. Increased heart rate at rest may not always occur as a result of the bad things. After all, it can be an indicator of some beautiful moments in your life, such as for example, love and happiness. We sincerely hope that you will not miss these moments and you will feel happy and healthy.